"How would you like to be the face of bodybuilding?" Freestyle Releasing has debuted an official trailer for an indie biopic titled Bigger, from filmmaker George Gallo. The film tells the story of the grandfathers of fitness as we now know it, Joe & Ben Weider. Facing anti-Semitism and extreme poverty, the brothers beat all odds to build an empire and inspire generations. Along the way, they discovered Arnold Schwarzenegger and founded bodybuilding as a sport. 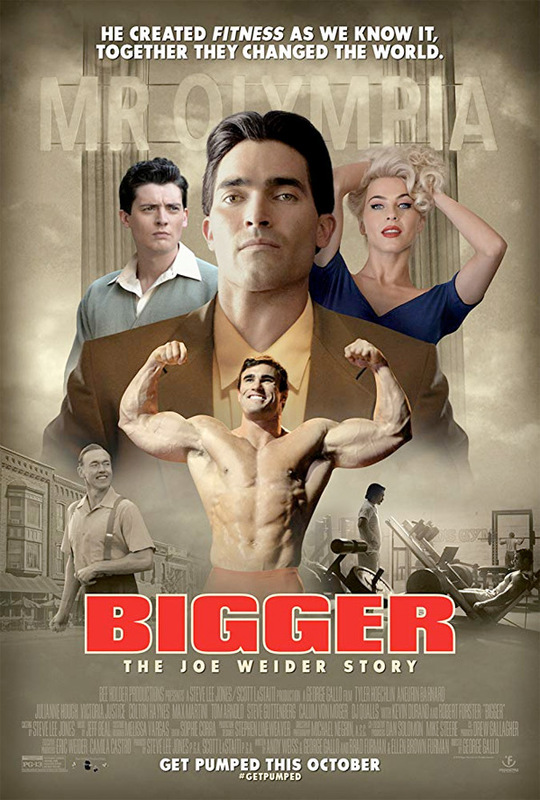 This stars Tyler Hoechlin as Joe Weider, plus Julianne Hough, Kevin Durand, Colton Haynes, Victoria Justice, DJ Qualls, Steve Guttenberg, Robert Forster, Aneurin Barnard, Max Martini, Tom Arnold, along with Calum Von Moger as a young Arnold. This doesn't look as good as it should, and seems a bit oddly timed to focus on the "impeccable man" in this day and age. Isn't machoism becoming a bit old fashioned? I'd rather watch a documentary about body builders. The grandfathers of the fitness industry Joe & Ben Weider battle anti-Semitism, conventional wisdom and extreme poverty to launch the fitness industry as we know it. Along the way they champion women's rights, sexual freedom, fight discrimination… and discover a guy named Arnold Schwarzenegger. Against all odds they launched the gym movement and created an empire. Bigger is directed by screenwriter & filmmaker George Gallo, director of the films 29th Street, Trapped in Paradise, Double Take, Local Color, My Mom's New Boyfriend, Middle Men, and Columbus Circle previously. The screenplay is written by Andy Weiss & George Gallo, and Brad Furman & Ellen Brown Furman. Freestyle Releasing will release Gallo's Bigger in select theaters + on VOD starting October 12th next month. Anyone interested in watching this?